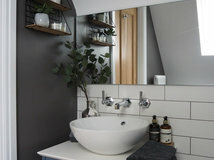 Bathrooms are so many and varied these days that you could say ‘anything goes’, but underneath the style there are some universal design principles that can point the way to success – whatever style you choose. 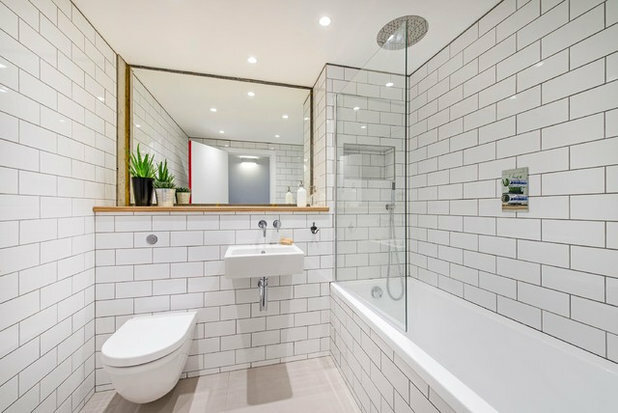 Bathrooms are often squeezed into the smallest spaces possible and then people still seem to want to cram in a bath, separate shower, twin basins, toilet and bidet. Give your space a break! Only go for a separate bath and shower if there’s genuinely enough room; otherwise, combine the two. 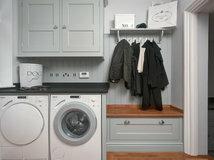 Remember that the user needs enough room to stand, dry themselves and turn around, as well as the space looking good. Bathrooms should be places to be calm and relaxed; if they’re chock-full of sanitaryware, it can all feel a bit like the Tube at rush hour. It can be tempting to buy lots of attractive lotions and potions, but the clutter can undo all of your good work in creating a calm space. 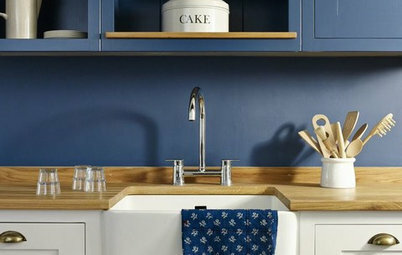 Rather than fight the inevitable, accept the reality and embrace great bathroom storage. The key is to think through exactly what you need to store and design appropriately. Some things can be best found in a drawer, some in a mirrored cabinet and others need a cupboard. 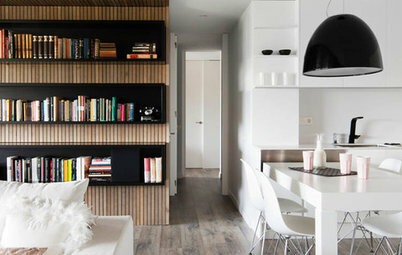 Consider how the storage solutions will work as part of the geography of the whole interior. 7 simple storage ideas for contemporary bathrooms. Even bathrooms with the most expensive fittings and sanitaryware can end up appearing disjointed if the details aren’t carefully considered. A common example would be a glass shower screen up against the side of a vanity unit. 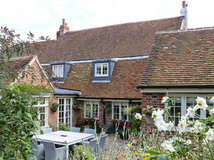 This might look great from one angle, but what do you see of the side of the unit through the glass? Will dirt get down there and be impossible to remove? Another pet hate is where tiling stops halfway up a wall, leaving a horizontal ridge that will only collect dust. 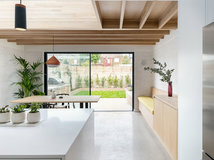 Either tile the whole wall, or set the face of the tiling flush with the face of the wall above by adding an extra layer of plasterboard above that line before the skim coat of plaster. Fundamentally, a bathroom must work. That means it should feel natural to use and be easy to clean, and all the essential elements must be accessible, clear, suitably lit and functional. Whatever design you adopt, never let style get in the way of function. That’s not to say a compromise is needed, though – any style can be worked into a well-thought-through, functional bathroom. 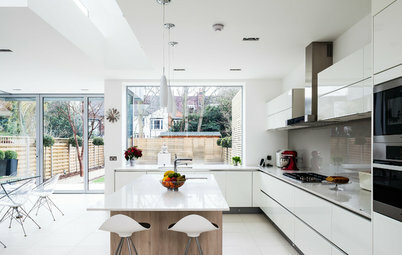 This scheme exemplifies two important ergonomic factors. 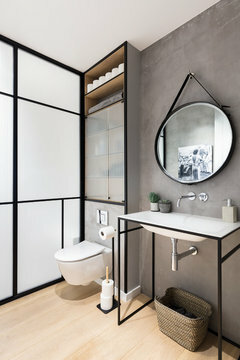 Clearly, users of this bathroom vary in height and washbasins with mirrors have been installed to suit all the household, which is functional but also very cute. 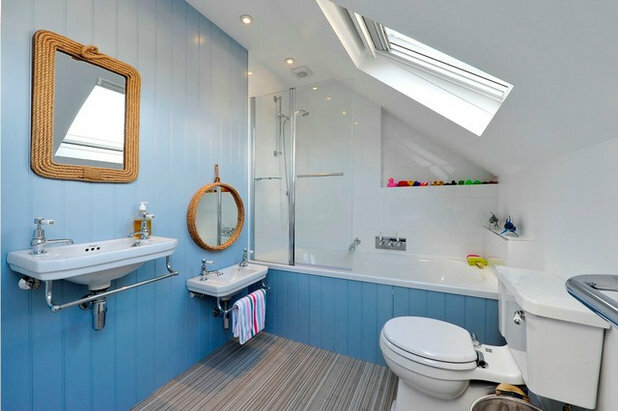 Also, with its sloping ceiling, there’s obviously been some thought given to orientation, with the showerhead and basin mirror under the highest part of the ceiling and the toilet and head end of the bath under the lower part. 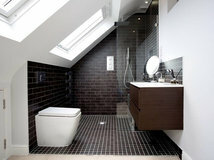 When designing loft bathrooms on plan, it’s all too easy to neglect thinking about necessary ceiling height. Rather than going for a tiny patch of tiling behind a washbasin, think about your bathroom as a series of horizontal and vertical planes. 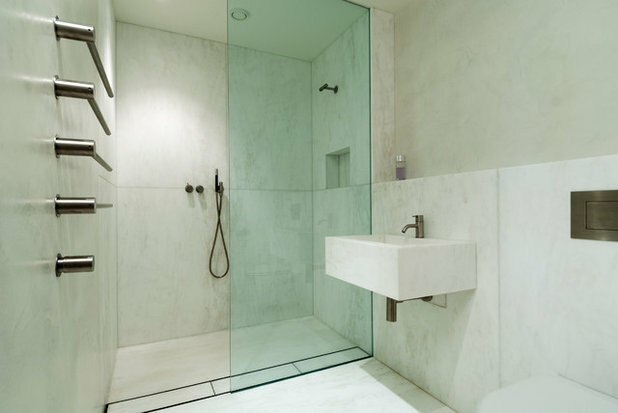 Whether they’re floor planes, wall planes, planes that enclose cisterns and plumbing, planes of tiles or planes of glass as shelves or shower screens, it’s a great way for your bathroom to feel ‘complete’. You can see the use of rectangular planes in this bathroom, which is compact but beautifully organised without feeling cramped, including the rectangle of subtly contrasting tiling on which the shower controls are set. It’s no coincidence that science fiction baddies always seem to have hexagonal doorways and chamfer-cut corners in their lairs. Unlike this very ‘pure’ bathroom, I’m sure the room Darth Vader used for his ablutions was largely black with angles everywhere. So, if you want to steer clear of the ‘dark side’, never use anything on a 45º angle. Corner basins, floor tiles in a diamond pattern, corner baths – even corner toilets (yes, they do exist) should be avoided. I know they may seem like a good idea on plan, but trust me, don’t do it – you will live to regret it. 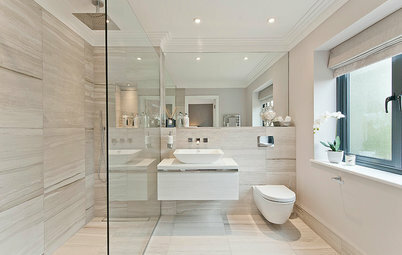 Find bathroom designers and fitters in your neighbourhood today. It’s not for everyone, but in many instances, the opportunity to go semi-open-plan between a bedroom and its en suite can work in some schemes. 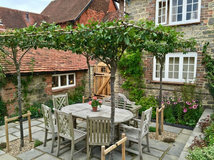 The benefits are generally in the greater sense of space and daylight that some overlap or combination of the spaces can give. 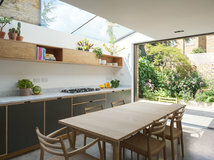 In this example, a clever (and beautifully detailed) sliding screen can adjust the level of openness vs privacy, which could just be the best of both worlds. 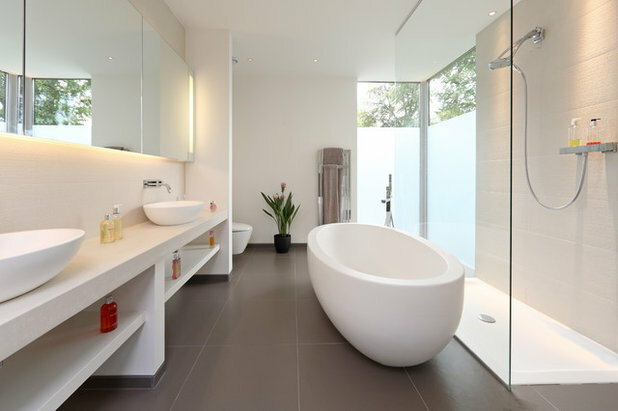 Bathrooms are frequently given the residual spaces that are left once the bedrooms have taken the best spots and windows, but spare a thought for those relaxed and contemplative times spent in the bathroom. 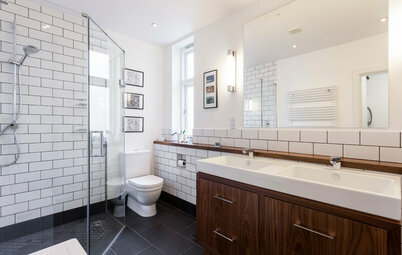 Daylight can be the most wonderful magnifier of space and, as such, is particularly important in small bathrooms. 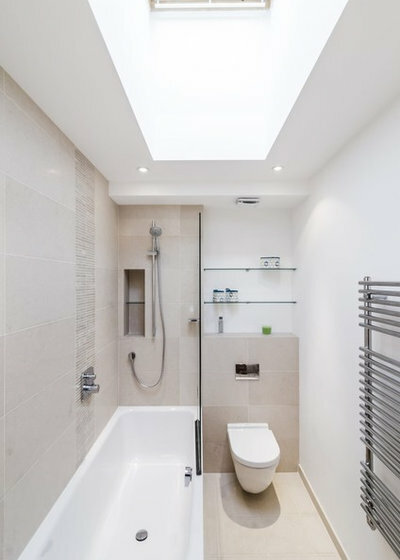 The most intense daylight comes from above, so roof glazing is often a great way to flood a room with daylight while saving the walls for sanitaryware and fittings. However, a bath with a lovely view is also a very attractive concept to many. This bathroom, although small, manages both beautifully. 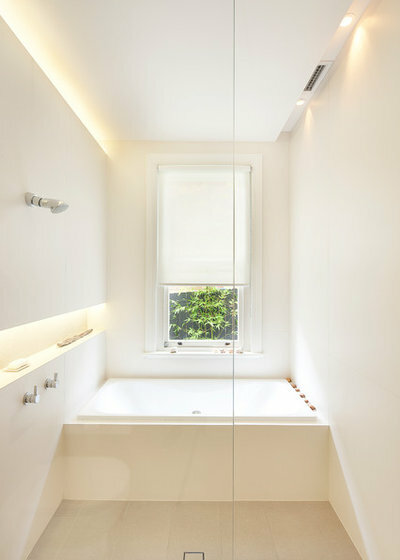 We’ve already mentioned daylight, but many bathrooms simply don’t have a window and, anyway, we all use bathrooms after dark, so it’s vital also to consider artificial lighting. As with any room, the solution comes as a combination of task and ambient lighting. You won’t want to be trying to do eye make-up in your own shadow, for example, so this scheme shows strategic use of a diffused light at face height to provide good illumination just where it’s needed. 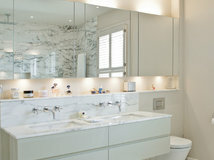 A concealed light source washing down from beneath the mirror is both practical and adds an ambient glow. 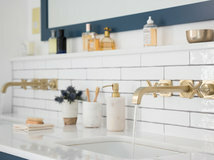 Many bathrooms play it safe with white/cream everything, but if you want to make your space more exciting, you need a hero. It can be a difficult balance to get right, because for every boring bathroom there’s another so jazzed up it gives you a headache. 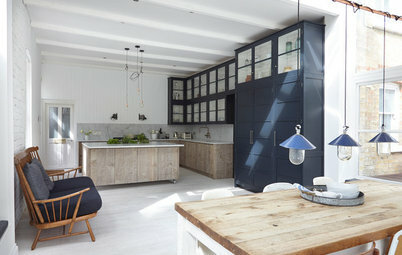 A great way to make it fun without going overboard is to choose a ‘hero’ suitable for the scale of the room it occupies. 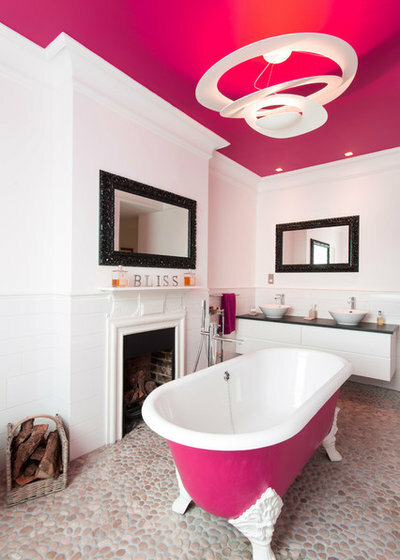 This could be a single wall of decorative tiles, a feature bath or a key colour, such as the raspberry pink used on the ceiling and bath in this Edwardian house. Which rules make the perfect bathroom for you? Share your tips or photos in the Comments section. Re lighting I'd suggest that having the right temperature bulbs plays a huge part in the atmosphere of a bathroom, as does having balanced light around your reflection (having just one light at the top of a mirror tends to accentuate facial shadows). 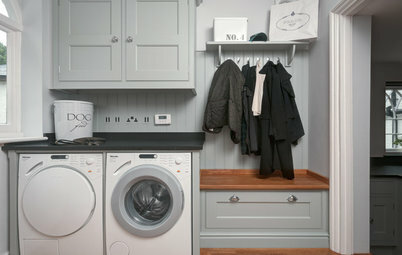 Another issue is having nowhere to store clothes other than the floor or the closed toilet lid when bathing. Some hooks or a small stool just feels so much neater/cleaner.